I can't wait! What a lovely barn. As you most likely know, barn conversion are extremely popular here and I think much more so than in the US. Perhaps because there is more real estate stock there so people aren't trying to squeeze any bit of an edifice into housing. It already looks beautiful and am sure that with everyone's input involved it will be another result fit for a magazine! Oh this will be an absolute gem, once boy gets his talented hands on it, I may want to move in. Hello Reggie, You are lucky to have so many surviving outbuildings, and are to be commended for including them in your restoration plan. Much of the charm and quality of old houses and buildings comes from their relation to the land and dependent buildings, and I am sure that when this project is finished, it will be amazing how much Darlington's charm will be enhanced. Like you, I have found that working on projects unrushed often has its advantages, not the least of which is more considered approaches. 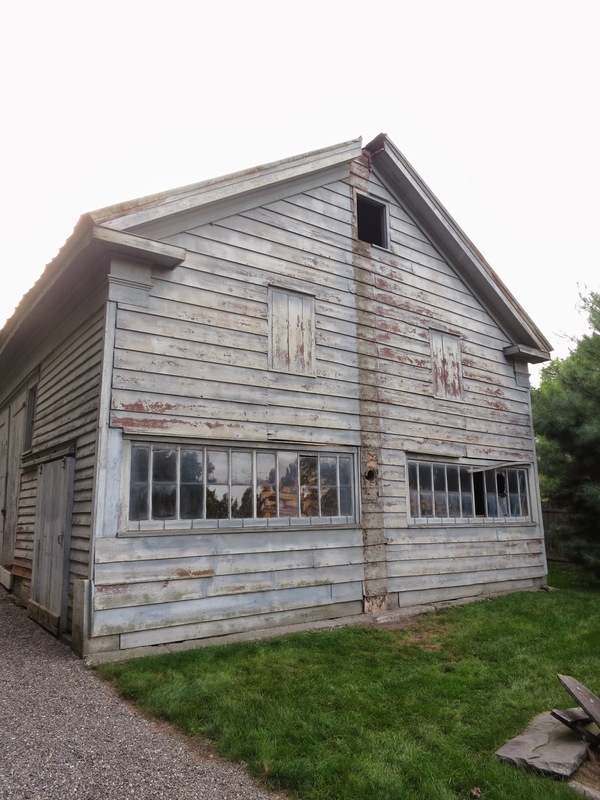 I'm so happy that you are able to keep the barn's tin roof, and also glad that the original window plan will re-emerge (whatever were they thinking with those horizontal windows!?). I'll look forward to watching the progress! I look forward to the journey, Dear Reggie.I grew up in an 1832 colonial revival in MA with several outbuildings, one of which was a life size 'dollhouse' complete with slate patio and working fireplace. It's all changed hands now, alas, but your wonderful tales of Darlington bring me back. Your barn will be beautiful, I am certain, because you and Boy are wonderful stewards. I did my dissertation on 18th- and 19th-century privies from an archaeological perspective. They are fascinating and very informative about many aspects of daily life. The 'house of office' or 'necessary', as it was called at different times, rarely survived but the filled privy beneath, when carefully excavated, is an archaeological gold mine. Diet, landscape, disease, and material culture use can all be determined in the right situation. It makes me wonder what you may have there! Yes, an absolutely stunning collection of outbuildings (along with the main house of course). I'm green with envy. What a wonderful place you have. Oh I didn't know about all these outbuildings. I love the fact you & Boy see this as a responsibility more as stewards to do this the right way. I look forward to seeing dispatches regarding these upcoming projects...especially that 'tin roof rusted' (couldn't resist a B-52 ref). I love old barns RD, and the people who restore them. We used to go to Folly Farm, in Maryland - and there was a disco ball in the old barn- it was a great party space! A beautiful building and a fascinating project I shall follow with pleasure. I love hearing the tales of those who choose to accept guardianship of historic homes & accept with great enthusiasm. It is gratifying to see you are honoring the design traditions of the historical period by not altering the basic structures or colors to reflect your own tastes and soothe your own egos. I also admire the notion of only moving ahead as is financially wise and not throwing all caution to the wind--many folks just throw $$$$$ at renovations wildly or worse (as in our 1956 bungalow do it all on the cheap thinking they won't outlive the effects of their poor decisions--I.e. duct tape as a fix-all; instead of digging a bit deeper to understand the cause of the original copper plumbing issues). I wish you the best of luck in your plans to make Darlington your fortress and refuge. I think the future generations of Proctors will be happy when they see what you have done with the old place or one day when you'll have a knock on the door and a grandchild will shyly ask to ask the house where they enjoyed a sweet summer vacation or magical Christmas and you can proudly show them the way you've saved the house from ruin. I wish you many happy days there! Lovely outbuildings. Presumably you're not restricted by planning laws. In UK they are the bane of anyone's life, especially if it's Grade 1 (or A in Scotland). Your buildings are very worthy, and it is grand to see you maintaining them properly. The community is so fortunate to have the two of you acting as owners/conservators of this most beautiful property. I would love to know how you decided upon just the right shade of green for your accent color. It is fresh and beautiful. You are doing a fabulous job, but then again Reggie, I am sure you know that! Hello Reggie, what a marvelous project you and Boy are undertaking. It makes me very sad to see homes of a certain age and character being butchered by their owners upon purchase, and making modifications that are not at all sensitive to the structure's age. Darlington, thank goodness, appears to be in good and caring hands. I love the posting from Anonymous dated March 23rd...in which he/she references a knock on the door and a grandchild from the Proctor clan asks to revisit the glorious house they remember from their childhood. They always caution us not to return to a house dearly loved but in your case, it would be magical. Thank you for doing this the right way. It is interesting that they went to all the trouble to add those huge horizontal windows, challenging the structural integrity not to mention a different direction in aesthetics. Is there any hint that they were reused from another location? Have you seen such windows in other outbuildings in your area? I will be watching for the progress! Just wondering if there is still a fireplace inside the barn, as you removed the chimney? I can't wait to see this unfold! I second (third?) the party space suggestion. Our friends down the street had wonderful barn parties 'til they sold, in favor of having a dock. Although dock parties are pretty sweet too. My husband and I are living in a 1915 farmhouse in central Virginia. During the 80s, after the house was sold by the original family to new owners, much was done to ruin it. Paneling, dropped ceilings, and other horrors. When we bought it, the mission was to "stop the bleeding." Now, several years and more dollars than I care to think about later, the projects that are looming are not essential and can be done at our leisure. I'll enjoy watching the progress (and not having to pay for it!) Best Wishes from another Old House steward. Yes, those 60's garage doors do need removing! I will follow your progress keenly, as everything you boys do is done so well.